Video, title, and image clips are the key to adding a Table of Contents (ToC) to your highlight video. By adding video clips to the Storyboard in Manager, you set reference points in the video, so that viewers can click on an entry in your ToC, and move to a specific point in your video. This only applies to videos produced as Flash outputs (MP4) or uploaded to Screencast.com. Place the selection buttons at points in your video where you would like a ToC entry, and create video, title, or image clips. Produce the highlight video, and view your Table of Contents. Did you know that if you produce to Microsoft PowerPoint, video clips are inserted automatically, one for each slide? As you view and analyze your recording, think about how to break it up for your highlight video. In the Analyze tab, move the Selection Start and Selection End buttons to the point in your recording where you would like to create a clip. Click Create > Video Clip (Title Clip ,or Image Clip). Or, just select the video clip or image clip button below the timeline. Give the clip a name. This name is also the ToC entry. You can always rename the ToC entries in the Present tab, so don't spend too much time on this now. Note that from the Present tab, you can click and drag clips from the Clip Bin to the Storyboard and rearrange the order. Rename a clip by double-clicking it in the Clip Bin (or by right-clicking the clip on the Storyboard and selecting Edit Properties). 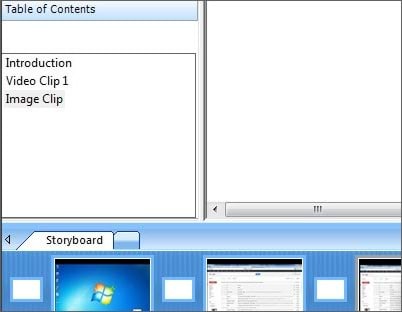 After you add clips to the Storyboard, you can preview the Table of Contents by clicking on the Storyboard, and viewing the ToC pane to the left of the Clip Bin. Click File > Produce and Share > Highlight Video, or click the Produce and Share button, or just press <CTRL+H> to begin the Production Wizard. To produce with the ToC, select either to Upload to Screencast.com or Produce to file. Remember that the ToC only produces to Flash outputs, meaning you should select the MP4 option if you choose to produce to file. Continue to produce and share your video as normal.